SurfLogger - track your internet surfing history including the data submitted to websites. Download Trial Version Surflogger Now! Purchase SurfLogger (Internet History Tracker) Now! Surf Logger is a tiny add-on for Internet Explorer that allows you to record detailed web browsing history, including data you submit to websites. 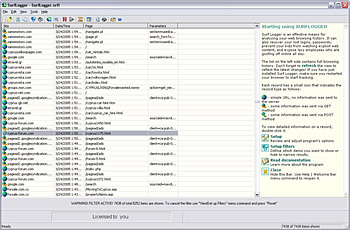 Featuring a complete set of filtering, search, export, and statistics options, Surf Logger comes as a convenient alternative to standard IE History and an effective means of monitoring and analyzing online activity on your computer at home and in office. Surf Logger captures all web connections and displays them as a list of records. By double-clicking on a record, you can view an accurate account for each connection, including website address, webpage, date, time of connection, GET and POST parameters. To quickly find and retrieve any needed record, you can sort records in alphabetical or chronological order or filter them by date and display only matching records. You can also specify any search string and find all matching records in a flash. The surf statistics option will help you view the total hit counts for all visited websites and find out the most frequently visited ones. Collected records can be printed or exported to a text file. What you can use Surf Logger for? In addition to its primary function of tracking web browsing activities, Surf Logger may have other utilitarian uses. It can be used to recover lost logins, passwords or any other data that you have ever submitted online. Surf Logger can be used by parents who can protect their children from seeing sexually explicit and violent web content. Parents can monitor what their children submit online and intervene immediately if something dangerous is going on. It can also benefit companies concerned with Internet abuse during working hours. By providing a visual verification of abuse, Surf Logger helps expose employees who are goofing off online all day. Surf Logger is available for Windows 98/Me/NT/2000/XP/2003 and requires Internet Explorer 5.0 or higher.